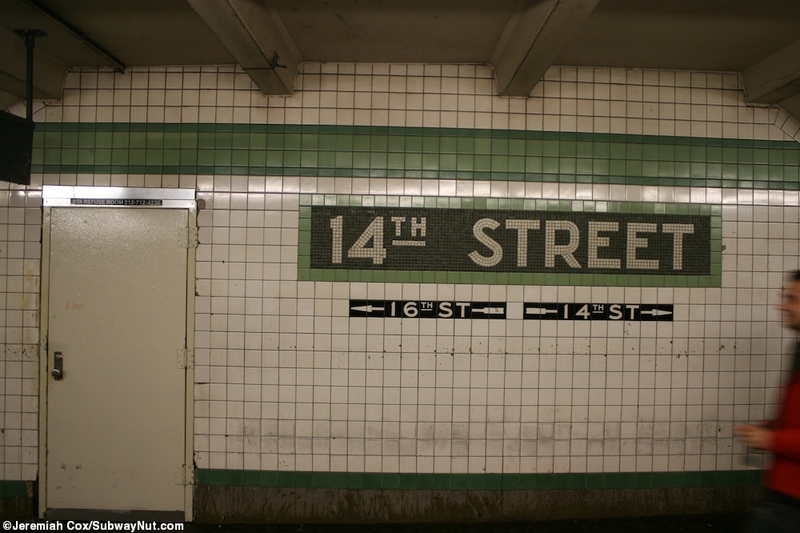 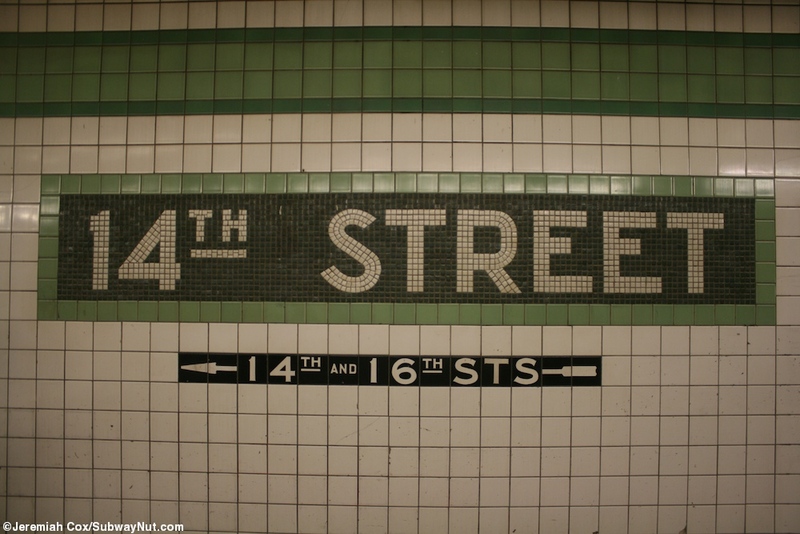 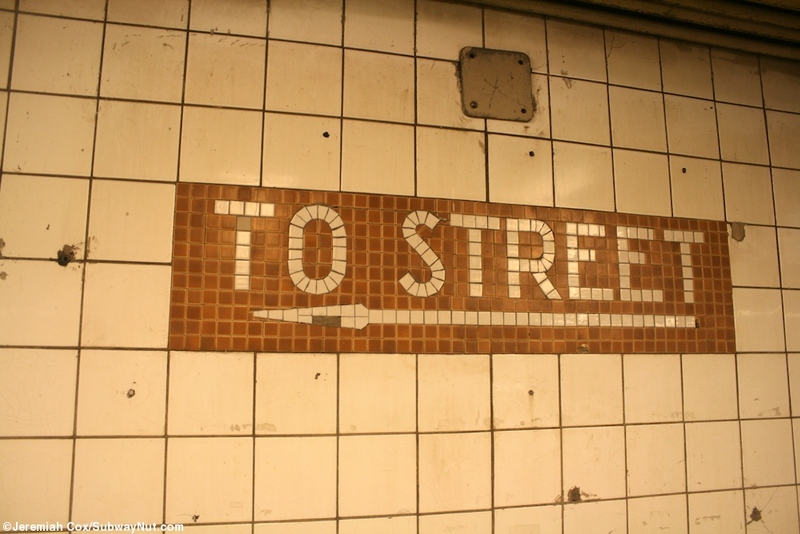 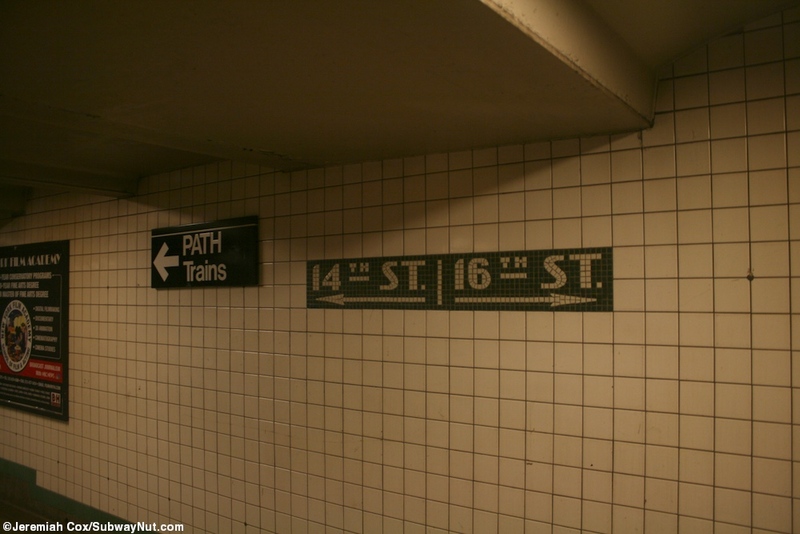 14 Street is a 6 Avenue local subway stop with a very unusual design do to the presence of the PATH trains and tracks between the subway platforms. 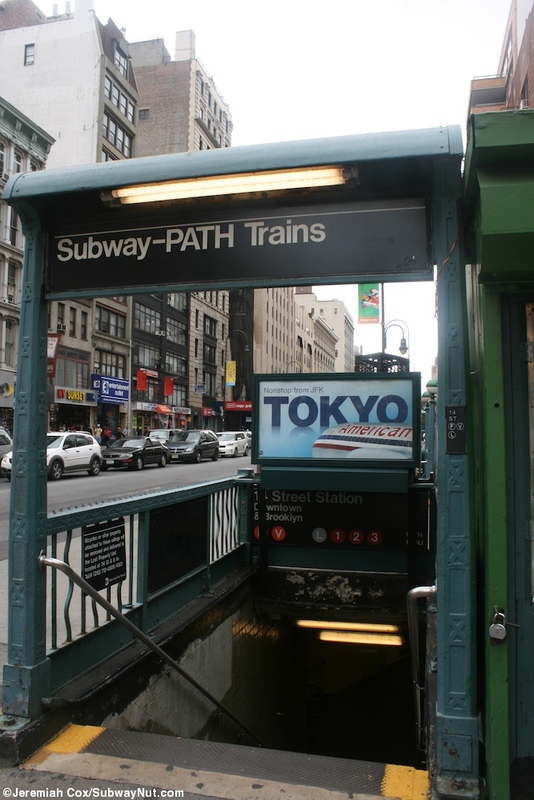 The stop has two separate platforms with the platforms on the inside of the tracks (doors open on the left of trains not the right like they are an island). 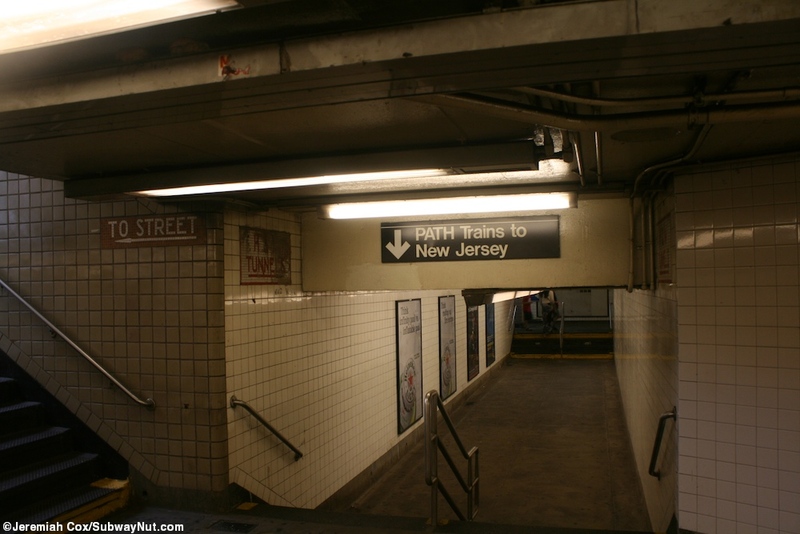 This is far from true. 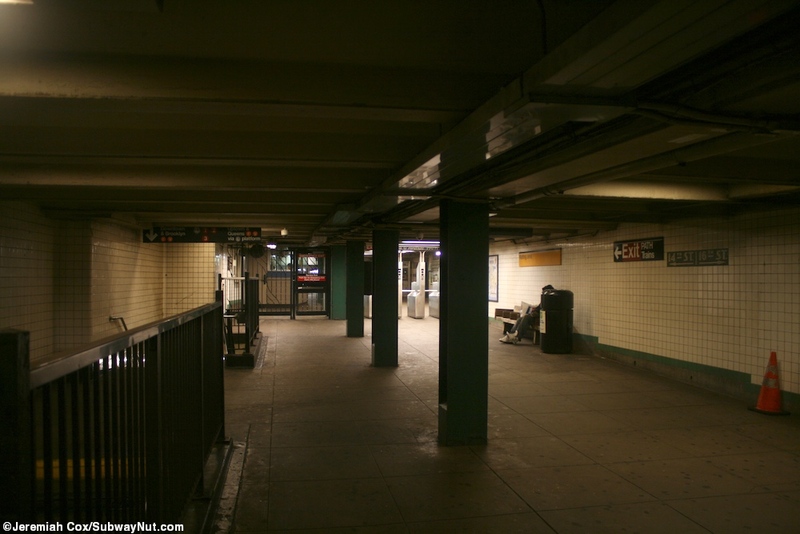 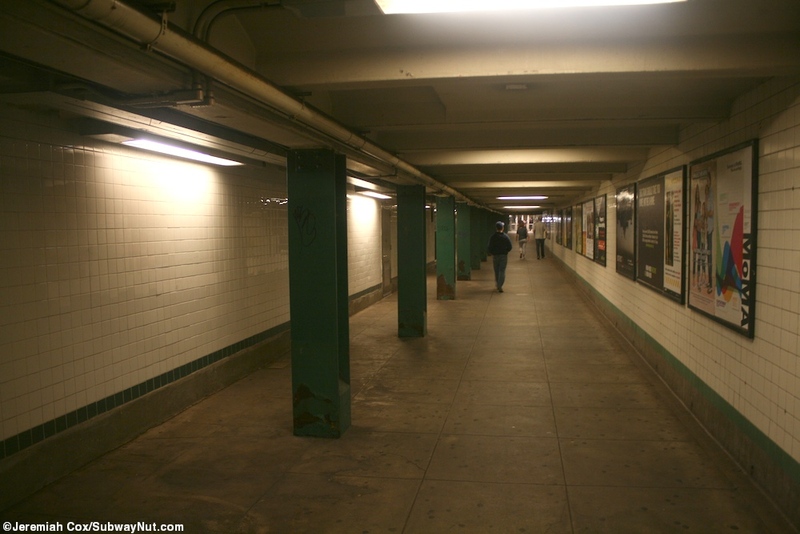 The only free (or paid for that matter without crossing 6 Avenue) transfer is via the L Canarsie Line platform beneath. 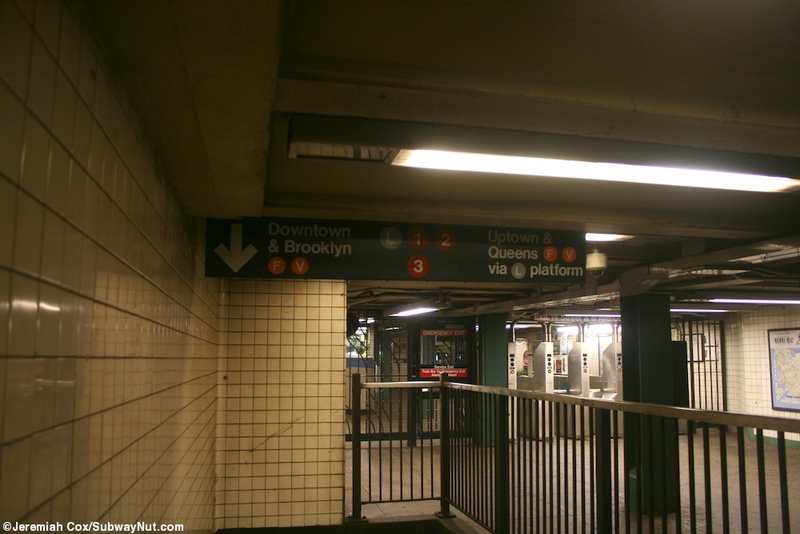 This transfer is facilitated by staircases (that curve 90 degrees at an intermediate landing to reach the Canarsie Line platfor.) 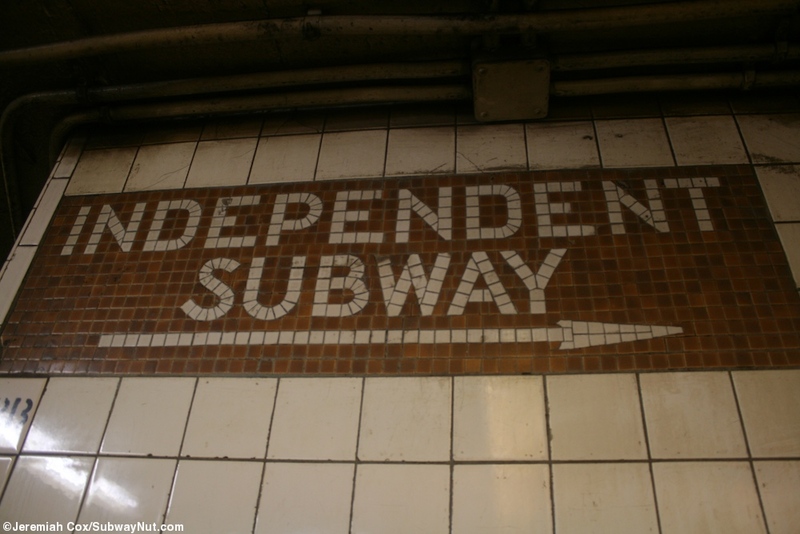 The two IND platforms and track walls have a green trimline with little 14s beneath the trimline and 14th Street name tablets. 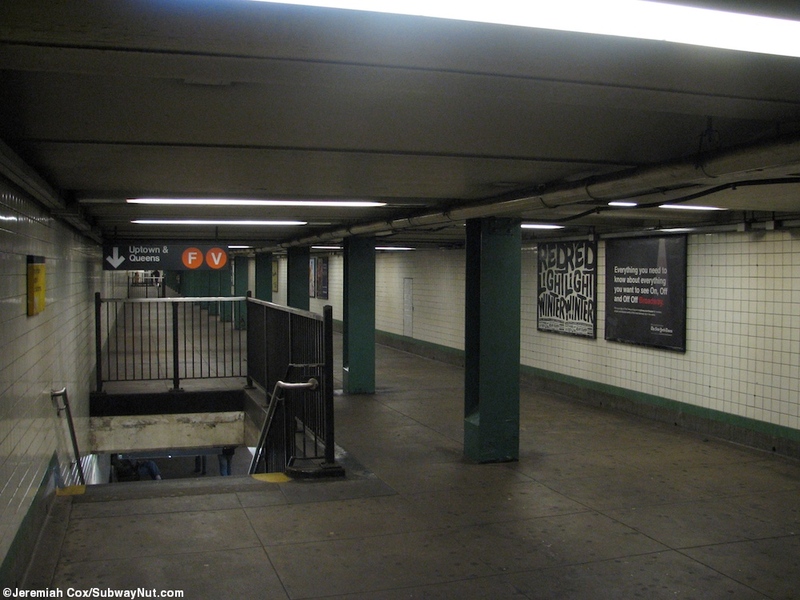 Each platform has its own separate narrow mezzanine area right above it with regular staircases up to it, and exits at either end. 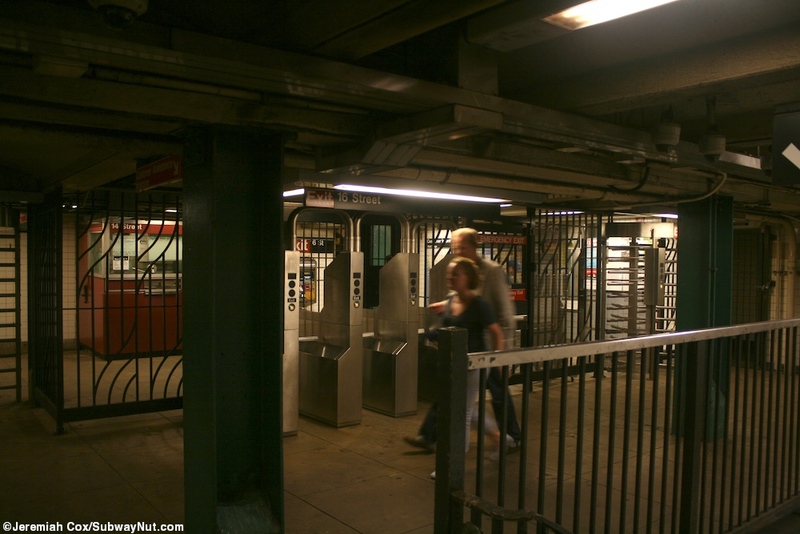 The northern exits with uptown trains accessed from streetstairs at the NE and SE corners of 16 Street and 6 Avenue and the NW and SW corners providing access to the downtown direction's mezzanine each have unstaffed with token both removed both high (from when the token booth was part time) and regular turnstiles. 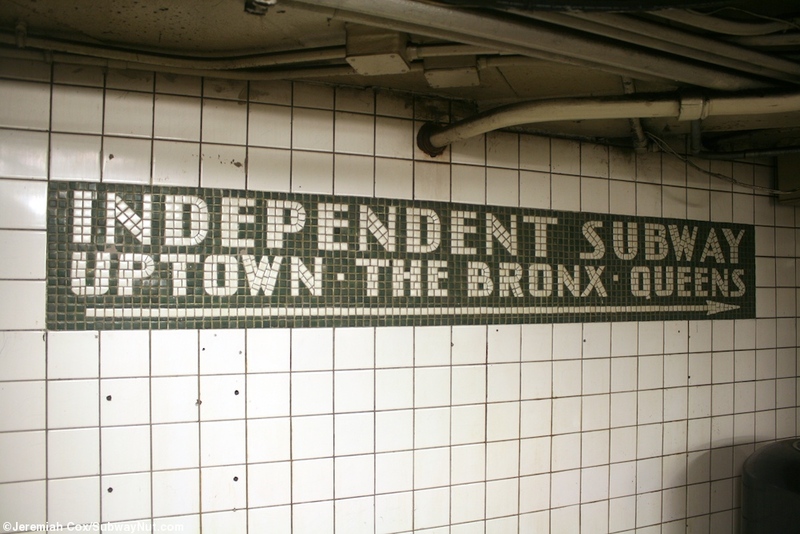 At the southern end (beyond the last staircase up from each platform) things get more tricky, but both fare control areas have wonderful historic intact mosaics directing passengers to the Independent Subway and its various directions (downtown, east side, Brooklyn or Uptown, the Bronx, Queens), the uptown side to the BMT Lines, and the downtown side to the H & M Tunnels to Jersey City, Hoboken, Newark since the entrance to the Jersey-bound PATH platform is through entrances shared with the subway (there is strangely no underground connection with the 33 Street-bound platforms, passengers must go via the street). 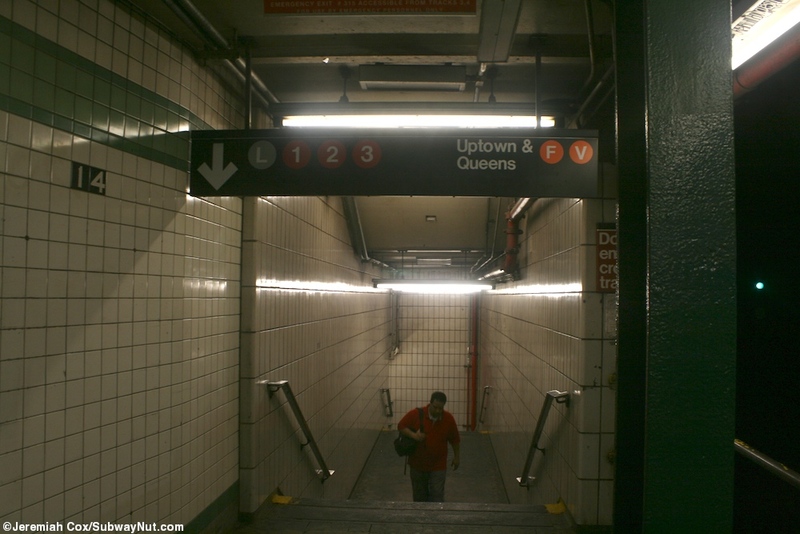 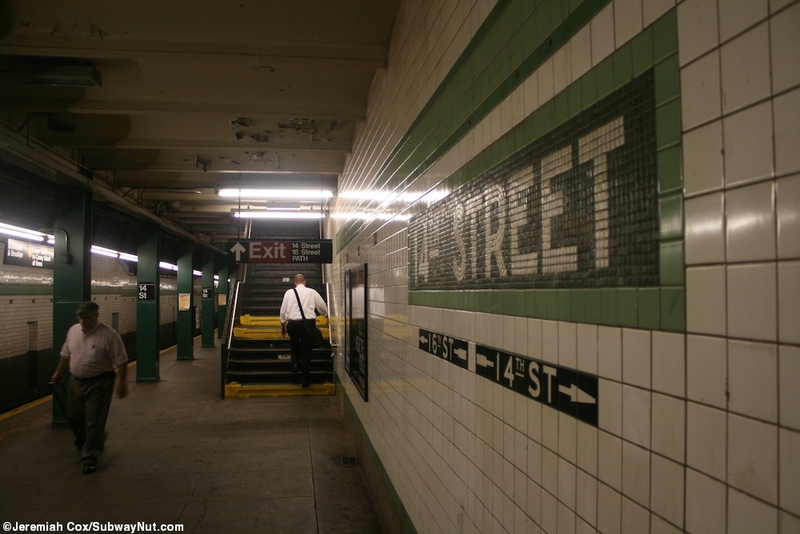 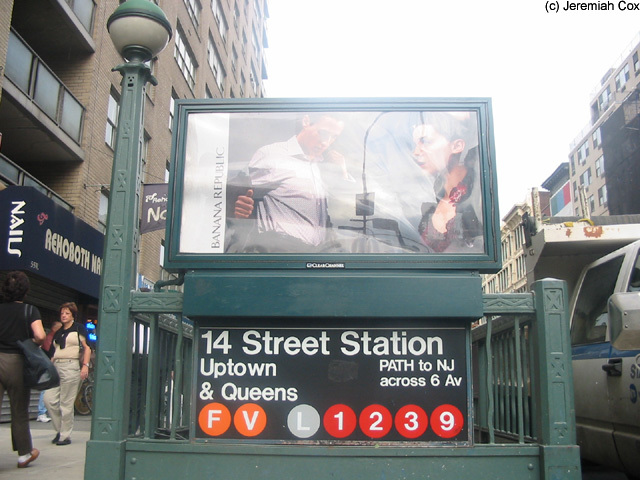 On the downtown platform a pair of street stairs lead from the SW corner of 14 Street and 6 Avenue, with the one closest to the corner having an unusual sign saying Subway-PATH Trains hanging between where the upper station globes would be leads to one narrow corridor that splits one that looks like any subway corridor leads north with a PATH styled corridor straight ahead that connects to another corridor running north-south with PATH's turnstiles to the south and anther connection to the main but cramped fare control area to the north where the full time token both is. 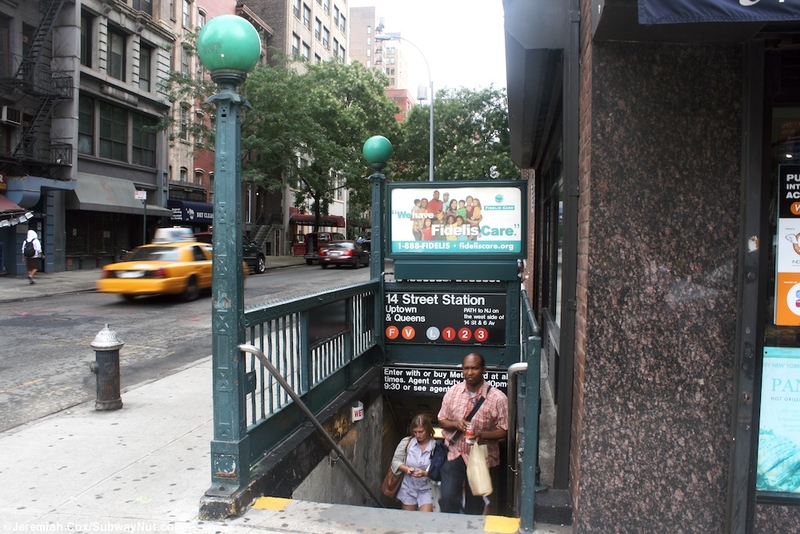 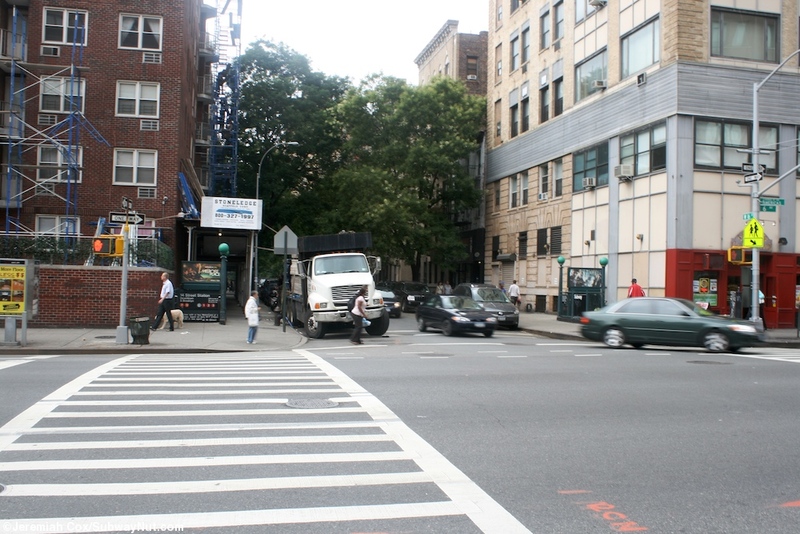 Here there are also two more street stairs (with the one closest to 6 Avenue having the same unique sign) out to the NW corner of 14 Street and 6th Avenue. 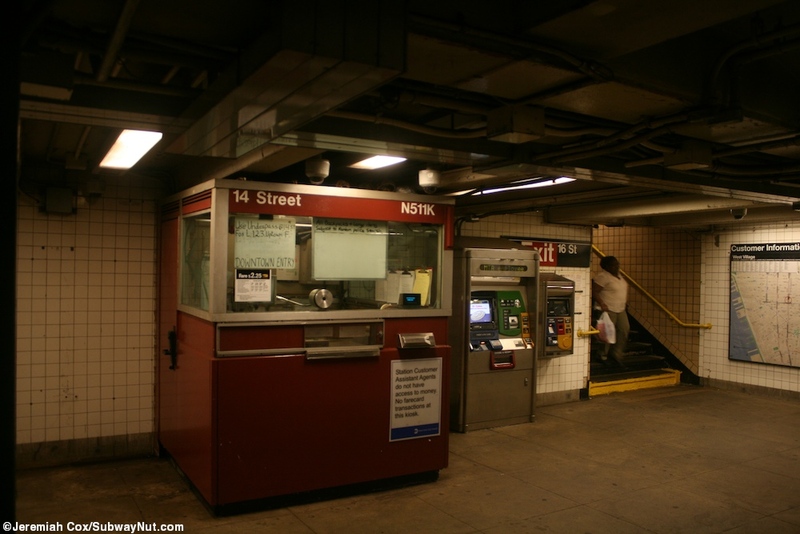 On the downtown direction the mezzanine ends at a now unstaffed bank of turnstiles followed by a pair of streetstairs to the NE corner of 14 Street and 6 Avenue. 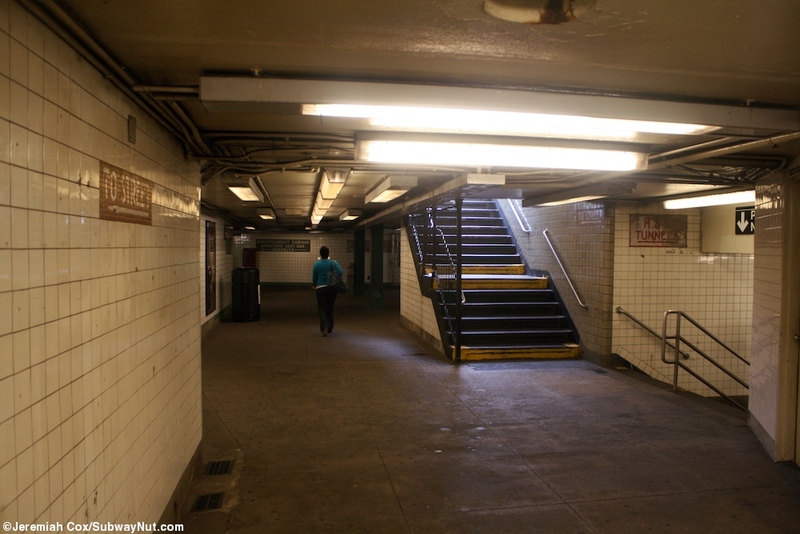 The corridor continues coming to another bank of turnstiles with direct access to the L platforms before ending with two street stairs up to the SE corner.